It has been quite a few years since I have read anything by John Maxwell. This book, given to me by a friend in the ministry, tops my book list thus far for 2014. 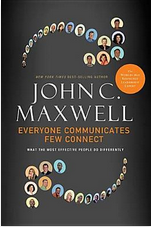 Absolutely loved the humility by Maxwell throughout the book along with all of the quotes, illustrations, and proven principles of connecting with people around you. In matter of fact, I underlined or highlighted 101 different quotes, lines, or illustrations in the book. This book was extremely helpful to me as a public speaker. However, Maxwell deliberately states that this will not only help the public communicator but anyone who deals with people on a regular basis. He also reiterates throughout the book that anyone can learn to connect with people…that it is NOT a natural born trait. He uses himself as an example who did very poorly in connecting with others as a young pastor for the first few years. I love the concluding chapter. In it, he states that the greatest earliest lessons he ever learned on leadership and communication came from the Bible. He then goes on to include some tremendous insight from Moses (I will definitely be using them in a message someday!) and how he LEARNED to be a good communicator; he definitely did not start out as one. Get the book and read it – you will not be disappointed!